It is now clear that the phenomenon of bears moving across Southern Beaufort Sea subpopulation boundaries compromised the US decision to list polar bears as ‘threatened’ and the IUCN Polar Bear Specialist Group (PBSG) knows that was the case. 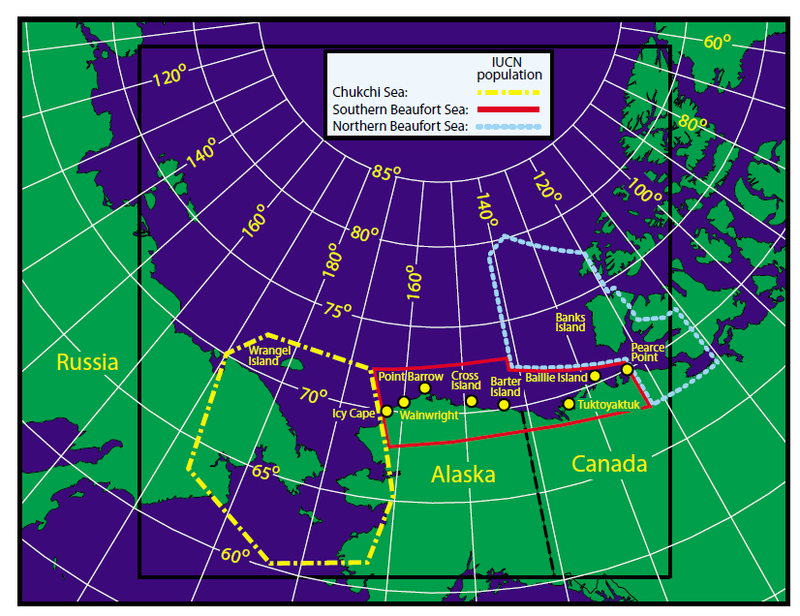 As I pointed out last week, the PBSG has admitted in their 2013 status table update (pdf here) that bears move around so much between the Chukchi Sea (CS), the Southern Beaufort (SB), and the Northern Beaufort (NB) subpopulations that major changes in the boundaries of the SB subpopulation are necessary (see Fig. 1 below). Figure 1. From the paper by Amstrup and colleagues (2005) describing the effect that movement of bears across subpopulation boundaries has on setting harvest quotas and population estimates. Southern Beaufort (SB) boundary is solid red, Chukchi Sea (CS) is dashed yellow and Northern Beaufort (NB) is dotted light blue. “Point Barrow” is Barrow, AK (well inside the SB boundary). Click to enlarge. Well, that’s not really news — changes to the SB boundaries were promised by the PBSG back in 2009 (Obbard et al. 2010), based on research by Steven Amstrup and colleagues published in 2001 and 2005. But now, in an astonishing admission, the PBSG have acknowledged that the last population survey for the SB (Regehr, Amstrup and Stirling, 2006), which appeared to register a decline in population size and reduced cub survival over time, did not take known movements of bears into account as it should have done. Since the population decline and reduced survival is now acknowledged to be unfounded — and perhaps deliberately so — I ask you this: will a new SB survey — soon to be released by the same lead author (Eric Regehr) — undo the broken trust in US and PBSG polar bear biologists? The middle sentence in the above quote (in bold) was not included in the 2009 PBSG status report (Obbard et al. 2009) – this is a new admission. “Just as the Agreement [for sharing harvest quotas between the US and Canada] was based upon the assumption that hunters share one population throughout the SBS [Southern Beaufort Sea], early population estimates were based upon the same assumption. “In the past, we did not know whether a captured bear represented the population we were trying to estimate or not. Not only did Amstrup et al. (2004, 2005) identify the overlap of SB with CS and NB population, they came up with a statistical solution for allocating quotas. The 2001-2006 data referred to by the PBSG (Regehr et al. 2006:3) came from bears captured from locations from one end of the SB region to the other: from beyond Barrow in the west and almost as far east as Pearce Point (Fig. 1). That broad capture coverage was considered a major strength of the study – but now, it’s apparent this was a major weakness. Amstrup and colleagues (2005:257) found that only bears captured between 1350W and 1530W (the central half of the SB region) could be assumed with high confidence to be SB bears (Fig. 2). Figure 2. From the paper by Amstrup and colleagues (2005: Fig. 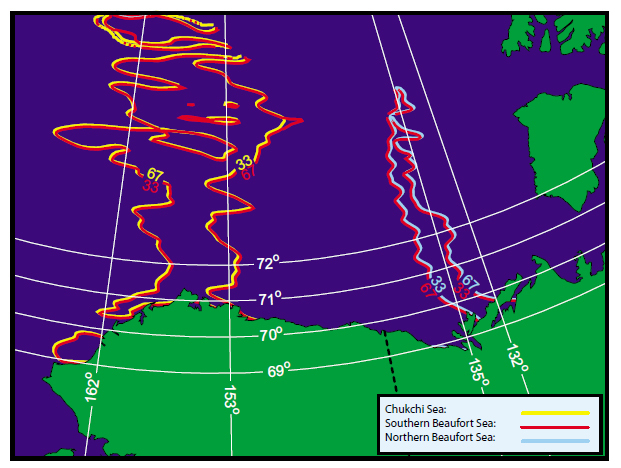 7) showing the restricted region in the central Southern Beaufort (135 to 153 degrees W), well east of Barrow and far to the east of Pearce Point and Tukoyaktuk, where any bear captured can be assumed with confidence to be a Southern Beaufort bear. But that was as far as it went — the ‘movement of bears’ problem was not taken into account when the population and survival estimates were made. “They chose to dismiss the high percentage of bears migrating out of the study area and subjectively chose to argue fewer captured bears meant more dead bears. So, in 2006, Regehr and colleagues apparently got away with ignoring the ‘movement of bears’ issue and the effect this would have had on their population and survival estimates. Now, six years after the ESA declared the polar bear ‘threatened’ based substantially on the Regehr-led study, the PBSG has acknowledged that the estimate was invalid but suggests that a new SB study, led again by Eric Regehr, will resolve the issue. The question is, knowing these people misrepresented data, arguably to support a desired outcome — and that this was was not caught by reviewers of their papers — is there any reason to trust the upcoming Regehr et al. report? Why should we not assume something similar will happen again? Footnote 1. Amstrup and colleagues’ 2001 paper, submitted in 2000 (Amstrup et al. 2001:230), stated that the probability of capturing Chukchi bears around Barrow in the western SB was 80-90%. Accounting for this bias in their SB population models gave them an estimate of more than 2500 bears, up significantly from the late 1970s estimate of 1,800. They concluded (Amstrup et al. 2001:233) that this amount of increase was unreasonable and suggested a “conservative” estimate of <2000 bears (later stated as “1,800”) was more useful for management purposes. Apparently, this is how conservation biologists do science. We saw the same practice, of spending enormous amounts of money on a mark-recapture study to generate data for a ‘scientific’ model and then ignoring the results, in the Northern (aka Eastern) Beaufort population study (previous post here).. In that case, because the researchers realized their model had not accounted for bears moving out of the region (generating an “unreasonable” decline over one year), they bumped the estimate upwards. Amstrup and Stirling were involved in almost all of the studies, while Regehr was common to the most recent ones only. Amstrup, S. C., York, G., McDonald, T. L., Nielson, R. and Simac, K. 2004. Detecting denning polar bears with forward-looking infrared (FLIR) imagery. Bioscience 54:337-344. Regehr, E. V., S. C. Amstrup, and I. Stirling. 2006. Polar bear population status in the southern Beaufort Sea. U.S. Geological Survey Administrative Report, U.S. Department of the Interior. Reston, Virginia, USA. 20 pp. pdf here. US Fish and Wildlife Service. 2008. Determination of threatened status for the polar bear (Ursus maritimus) throughout its range. Federal Register 73(95):28212-28303. Pdf here. This entry was posted in Advocacy, Conservation Status, Population and tagged abundance, Amstrup, Chukchi Sea, computer models, ESA, Jim Steele, migration, movements, Northern Beaufort, PBSG, Polar Bear Specialist Group, population estimate, population overlap, Regehr, Southern Beaufort, survival estimates, threatened, trust, US Fish and Wildlife Service. Bookmark the permalink.